CP Submersible Sewage Pumps are designed for economical and reliable pumping of sewage water from commercial, residential and industrial sources. 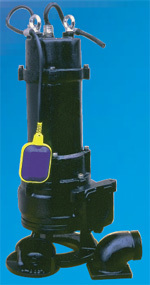 They are suitable for pumping clear and waste water containing solid and fibrous material. Used in conjunction with the automatic coupling system, the below ground level wet installation is a particularly economical solution which also does not damage the environment. These pumps are also suitable for quick portable applications. Speed: 1450 and 2900 RPM. Discharge diameter: 2 - 6 inches (50 - 150 mm). Head: 20 - 131 feet (6 - 40 m). Power: 1 - 10 HP (0.75 - 7.5 kW). Power source: 110 - 380v, 50 Hz.